“We are right there in every game. We are just not scoring when we need a score,” said head coach Klark Kindler on his team’s performance. The Cowboys host Plateau Valley Friday. MEEKER | The Cowboys traveled home from Paonia Saturday after losing their third game on the weekend. A record of 4-7 overall and 2-3 on the league, the team is struggling shooting. Thursday and Friday the Cowboys hosted home games to Little Snake River and then De Beque. Narrowly losing to Little Snake River, the final score was 41-38, the Cowboys were ahead until the fourth quarter, and the Rattlers pulled ahead for the win. Sophomore Ryan Phelan scored 19 points, the only Cowboy to reach double digits, and pulled down seven total rebounds. De Beque, ranked fifth in class 1A, dominated the boards against the Cowboys, with a 60-45 win. Twenty four points were split equally between Phelan and Andy Kracht as leaders in both scoring and offensive and total rebounds. In the final game of the weekend, the Cowboys traveled to Paonia and fell to the Eagles 45-36. The Cowboys kept it a close match-up until the fourth quarter, where they were outscored 18-10. 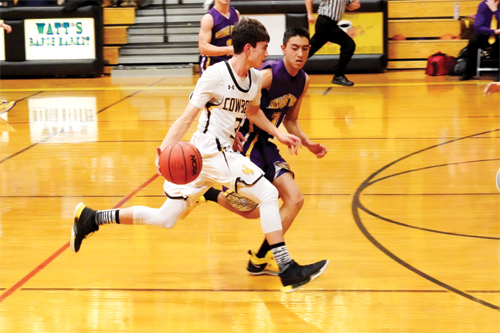 Friday the Cowboys host another league game against Plateau Valley, “Every game is important from here on out as we try to get a good seed for the district tournament,” said Kindler. Saturday will also be a league game as the team travels to Vail Mountain to battle it out against the Rangers.